by Bill Dwight on Monday, August 09, 2010 at 1:26 PM | LEAVE A COMMENT! This is entry #9 in a weekly summer series typically penned by “guest blogger” and FamZoo summer intern Haley Dwight. Haley was out of the office last week, so I’m filling in with some of my favorite finds over the past week. The guys at DadLabs make some pretty darn amusing videos. Check out this one about getting kids to do their chores. Have you been through all 6 phases? I think their suggestions are really good for kids on the younger end of the spectrum — before they turn into jaded t(w)eens at which point you may need to turn to an approach with more stick than carrot. Kim covers four solid tips for putting your teen in control over the money they receive. 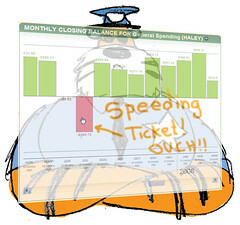 I particularly like the speeding ticket example in #4. That’s happened to Haley. I paid the fine right away since she couldn’t afford it, but had Haley pay me back over an extended period of time. We used FamZoo to track the progress on her loan payback. A provocative title for a wise article containing 7 excellent reasons to hand over more purchasing decisions to your teen. The emphasis on budget-based allowances is key: when used properly, an allowance is all about constraining spending, not expanding it. This article offers 8 solid tips for how parents can lead by example to teach their kids good money habits. I like the distinction made in tip #6 between Medium and Long-Term savings and having separate buckets for each. That’s an option we should probably add to our quick Bank Setup wizard. Note: if you’ve created our common Spend/Save/Give account setup, you can add an additional account for Medium-Term Savings at any time. 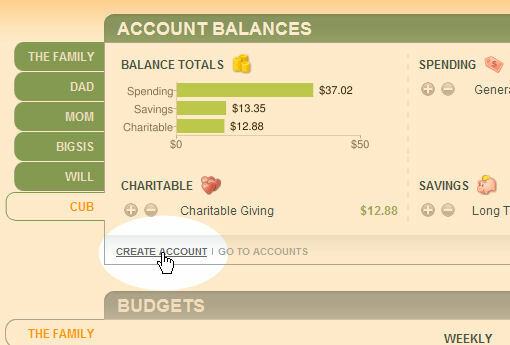 Just click on the "Create Account" link at the bottom of your Account Balances section on the Overview page. Fill in the fields to create the new account for Medium-Term savings. Click on the Go To Allowances link to see your existing allowances. 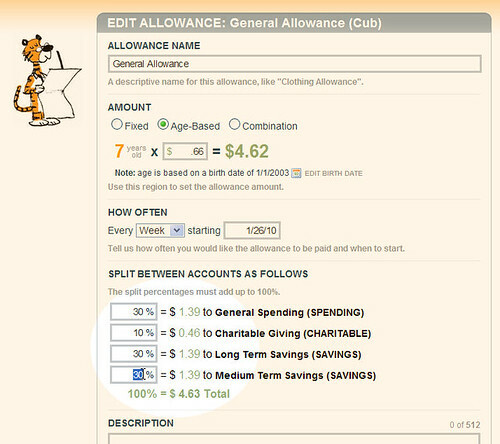 Hover your mouse over an allowance and click on the pencil icon to edit it. Then, you can edit the existing allowance to flow into all four accounts using the proportions that make sense for your situation.